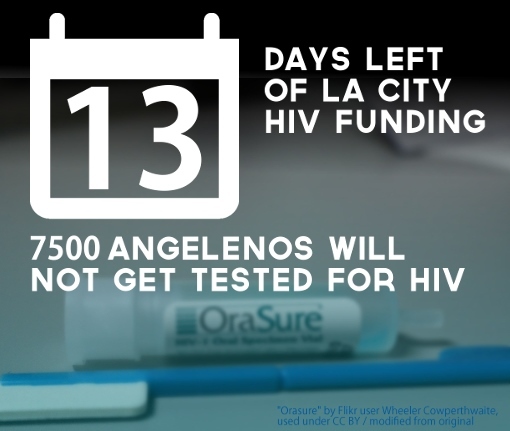 The City of Los Angeles AIDS Coordinator’s Office is facing a funding gap that could disrupt or kill irreplaceable HIV prevention services. Contact the Mayor and your City Councilmember today and ask them to find a solution. As the Los Angeles Times recently reported, the Federal government has changed the guidelines for the way cities like Los Angeles use money from the Department of Housing and Urban Development (HUD), resulting in sudden cuts to HIV services that the city has funded for years. We need the City Council to immediately come up with replacement funding to ensure that these vital services continue without interruption. These programs support an array of innovative HIV prevention activites in Los Angeles: HIV testing at targeted sites; health education including APLA’s Red Circle Project, the only outreach program for our local Native American population; syringe exchange and disposal programs that have no other source of support in part because of a federal funding ban on needle exchange programs. These are proven strategies that target some of our most vulnerable populations and are part of a critical public health network that reduces the burden of HIV throughout our city. Beginning next week, the City of Los Angeles AIDS Coordinator’s Office will have no funding for these programs for the next three months. If these programs can survive, they face a severe 43% budget reduction when they return. We need funding to cover those services for the next three months while we work to save these irreplaceable public health programs. Both Mayor Garcetti and City Councilmembers have expressed their support for these programs – the time is now for us to work together to avert this public health crisis. Look up your Councilmember’s contact information. Call or email them to express your concern about pending HIV prevention budget cuts. As a constituent, I am calling to ask my Councilmember to stand up and support our city’s HIV prevention programs. I recently learned that the city plans to stop funding HIV services for three months starting next week, and that after that there may only be limited funding available for the next year. These programs are critical to our efforts to end the AIDS epidemic and improve our community’s health. A gap in services could be have serious consequences – and costs – for our city. It would take $260,000 to cover this 3 month gap, stopping just ONE new HIV infection will save us $385,200 in treatment costs. This HIV funding crisis gives the council the opportunity to show the country what makes this city great – and to continue our proud history of standing up for people with HIV and AIDS. Take action now. Thank you! The return address for this e-mail is not monitored, To send an e-mail, please use info@apla.org. 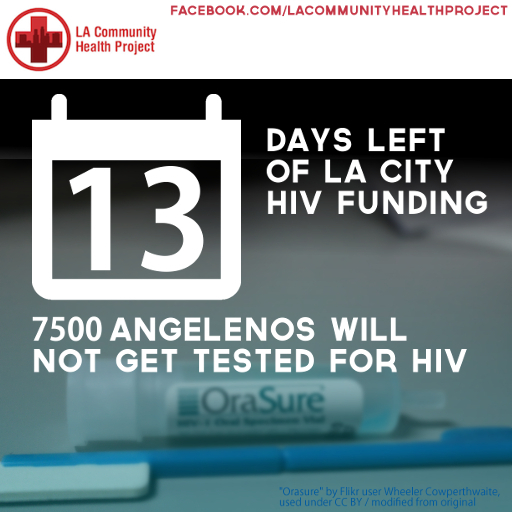 ACTION ALERT: 7 days until all City HIV prevention funding is stopped. PLEASE ACT NOW. Over the past couple of weeks people have been asking what they can do about the LA City budget cuts to HIV programs. One thing you can do is call your council members and encourage them to stand up and support HIV programs. Below find a sample script you can use when making the calls. Attached please find a fact sheet andtranscribed quotes from the council members last Monday’s budget meeting. A group of us will be visiting council offices on Thursday to drop off information and let them know in person that we care about these cuts. Please let us know if you’d like to join us. The Federal government is changing the guidelines for the way cities like Los Angeles use money from the Department of Housing and Urban Development (HUD). Those changes are resulting in sudden cuts to HIV services that the city has funded using money from HUD. We need City Council to immediately come up with replacement funding to ensure that these vital services continue without interruption. These programs provide HIV testing, health education, many efforts to reach people who inject drugs including outreach, syringe disposal, overdose prevention & naloxone distribution. These programs are part of a critical public health network that reduces the burden of HIV throughout our city. These prevention programs use evidence-based public health strategies to work with populations most impacted by HIV. Please stand with these programs and let your council members know how important they are. We encourage you to use social media to promote this call to action to help amplify the message and encourage others to connect with their council members as well. Call your Councilmember’s office and Councilmember Cedillo who is the Chair of the Housing Committee. We want to acknowledge the on-going support provided by City Council for these programs while also register the urgent need to bridge the funding gap. Be courteous and respectful! Keep in mind that the staff person answering the telephone is more likely to accurately record your message if you speak to them respectfully. Hello, my name is ________, and I am a constituent/ a resident/ an HIV service provider/ a consumer of HIV services/ a mom/ whatever you’d like to identify as. I learned (cite the LA Times article if that helps) that the city plans to stop funding HIV services for 3 months starting next week, and that after that there may only be 57% of the funding needed for the next year. I am calling to ask the Councilmember to stand up and support our city’s HIV prevention programs. I care about these programs because they help reduce HIV and improve my/ our community’s health. A gap in services could be have serious consequences – and costs – for our city. It would take $260,000 to cover this 3 month gap, but only ONE new HIV infection will cost $385,200 to treat. This HIV funding crisis gives the council the opportunity to show the country what makes this city great – to show the kind of leadership the council has shown before and continue our proud history of standing up for people with HIV and AIDS. Is anyone interested and/or do you know someone who may be interested in conducting this group for the Laurel Foundation? a licensed Psychologist would be ok for them as well. We are in need of a California licensed Social Worker, who can volunteer their time once a month (day is flexible) from 8:30 PM – 9:30 PM to facilitate a video online support group. The group is composed of five English-speaking mothers who are either HIV+ or have children who are HIV+. We are looking for a commitment of one year. So there would be 12 sessions (summer months and in December we usually do not have a session due to holidays etc.). The Laurel Foundation will do all the backend work (make sure all parents are reminded of the call) and be on call should any issues (technical or otherwise) arise. Please have anyone who is interested contact Cheria Young (The Laurel Foundation’s Associate Director) at CYoung@Laurel-Foundation.org or call the office at 626-683-0800. HIV/AIDS changes lives. So does The Laurel Foundation. for any HIV prevention & education programs for 3 months. After that, they may decide to only pay for 57% of what they need to keep services as they are now. please circulate these graphics far and wide. City Council needs to use Community Development Block Grant Funds &/or General Funds to cover the 3 month gap in services and to make up the remaining 43% needed to keep these programs funded in FY 2014/2015. Tell your Councilmember: We can’t afford these cuts! I don’t know if you’ve seen this, but a letter was sent out to prevention programs yesterday around 10am. I’ve attached it to the post linked below. Can you please help get the word out about this ASAP? And if anyone is interested in organizing a community response, please let me know. 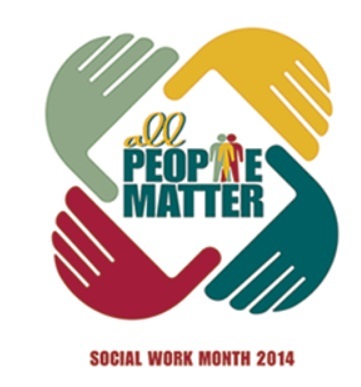 National Social Work Month Begins March 1! The nation’s largest group of social workers, the National Association of Social Workers (NASW), begins its month-long celebration of the profession in March. According to the Bureau of Labor Statistics, social work continues to be a fast-growing occupation in the United States. More than 600,000 social work college graduates hold social work positions, and an additional 130,000 people are employed as community and social service managers. As the country addresses issues of growing income inequality, educational achievement gaps, health care disparities, mental health access, and improved veterans support, social workers in communities across the nation are raising awareness about critical family needs and social injustice. To recognize all the ways social workers make a difference, and how they help turn public attention to complex social issues that affect millions of lives, the 2014 Social Work Month campaign will highlight some of the profession’s most accomplished authors, educators, researchers and practice leaders through its 1,000 Experts initiative. More details about social work contributions on topics ranging from domestic violence, foster care and depression to addictions, chronic illness and senior caregiving can be found atSocialWorkers.org or SocialWorkMonth.org. Social workers are also invited to tell their stories online this month using the hashtags #allpeoplematter and #socialworkmonth. Get your hands dirty— our trainings utilize group activities, interactive exercises and self-reflective tools to help inspire your work as a recovery oriented practitioner. Registration is FREE for LACDMH clinics & contract providers. People receiving care for mental health problems are four times more likely to be living with HIV than the general population, and many are unaware of their status, revealing a key demographic for targeted HIV screening programs. Publishing their findings in the American Journal of Public Health, researchers provided rapid HIV testing to 1,061 people who sought treatment for depression, psychosis or substance abuse in Philadelphia and Baltimore between January 2009 and August 2011.